I don't see many posts about this bike...anyone riding one? I just bought a 2014 and now I'm anxiously waiting for it to come in this week. I was really eyeing the Superfly, but I got a price that I felt was hard to beat. This is the 2015...I don't see many changes '14 - '15. Beautiful bike, and yeah even at msrp that's a lotta bike for the money. 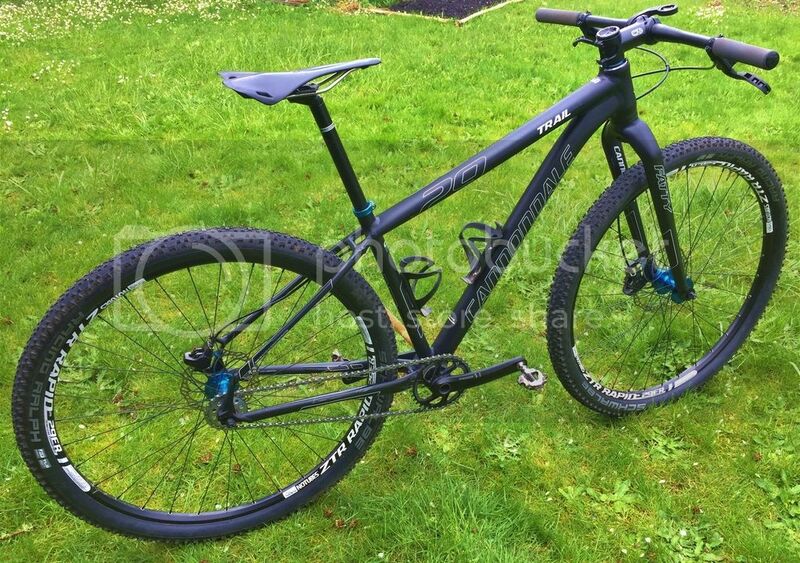 Frame-wise, top tube is a bit shorter than the superfly, trail is a bit less. That would actually fit me better than the fly. I'll bet it's a sharp steerer. Love what they've done with the shape of the tubing. What's that fork made out of? Component wise, nice rims. Dunno about those cranks but I swapped out cranks anyway, so many good deals out there. Bulletproof setup as is. Interesting rear hub, kind of like the King iso? Interesting gearing, I'm gravitating toward 33/20 myself but I'm using 165mm cranks. Still though a 33t ring would cover a lot of options within the adjustment range of my chain tension. Lose that rear cog asap, I rode around for a week on a cheap cog and it already started gouging my hub, which can quickly cause problems if you get a tight fitting cog like EndlessBike. Are you thinking about sticking with 20 in the back? 19 might be better in the flats. Get yourself tubeless asap. Racing ralph should be an awesome rear tire, ~600g on those rims, shoot that is gonna rock. You might need some more stickum up front depending on conditions. If you like schwalbe, I've had good luck with nobby nick @ 2.35 up front. If you're not used to riding rigid, it's gonna feel pretty harsh at first. Get your pressures down, think about some ESI extra chunky grips, and relax. Don't choke the bars. Give it a couple of weeks before you let yourself get frustrated, there's a learning curve. Regardless of what that fork's made out of, riding rigid is like 80% technique, and most of the rest is getting your tires set up imo. You are now officially a macho man, people are gonna be scared to even talk to you now. Wow, thanks for the great reply. I feel even better about the price; I paid $850, but I had $50 in my paypal that I fogot about months ago. That was a pleasant suprise. The fork is aluminum. I will potentially upgrade that, but I'm going to see how it goes first. I have a never ending list of bike upgrade projects and I want to be careful not to turn this into one. I've heard the EBB isn't so hot, but it was in reference to older models. I'm hoping it's not the same. I'll definitely set up the tubeless before it ever sees the dirt, and I'm almost certain I'll be happier with a fatter tire out front. Bike came in and boy am I stoked. Not too shabby weight-wise either--wish my bike was 23lbs…. I ride a 2010 SL. Swapped to hydraulics, 180mm rotors, XT crank, shifters and deraillers, and built up some DH wheels. The bike is a monster, very sharp handling even with a cheap RST fork, feels lighter than it looks, not one complaint under my clyde arse. 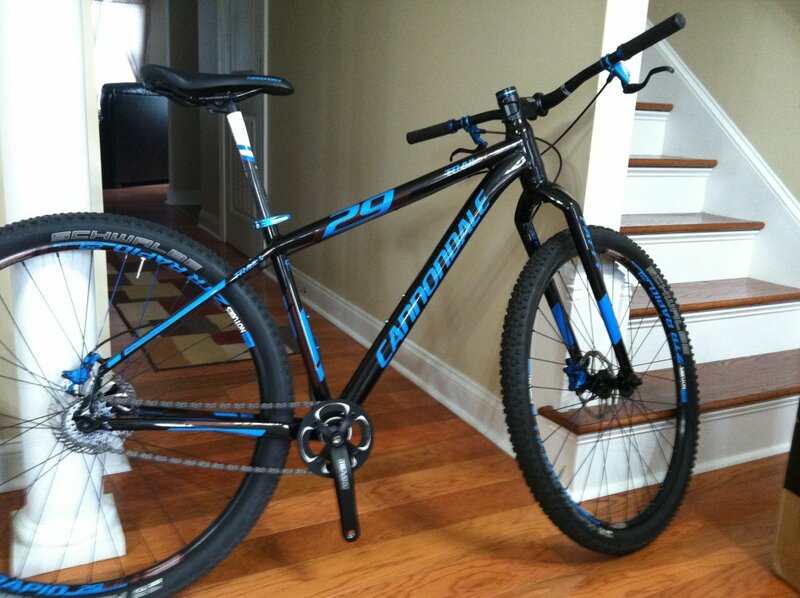 I picked up a '14 Cannondale Trail SL3 29er SS last month, and I love it. Got a great deal on it too. Many of the components have been upgraded (Stan's Crest ZTR rims, Stan's 3.30 hubs on front and back, tubeless tires, KMC K710SL chain, XT crankset, Hollowtech II BB (sm-bb70), upgraded saddle, esi fit xc grips, nashbar clipless pedals, XT rear and Elixir 7 front brakes, FSA chainwheel). The bike is lightweight, nimble, fits me well and is sturdy even under my Clyde self (I'm 6'3", 226 dry/240 with kit). I'm riding trails in N. Central Florida (San Felasco) with lots of roots, and it's actually very comfortable. The tubeless tires and grips go a long way. My only complaint so far is that the EBB (which I believe is stock) is very creaky. Thankfully, the tool i need to take it apart should arrive tonight and I can go about greasing it up. Last edited by Bhaalgorn; 08-06-2015 at 01:44 PM. Nice work Bhaalgorn. That sounds like a gem with all those upgrades! What tool is needed to take the EBB apart? I tightened up my chain with a pin spanner I had laying around....didn't seem like it would need anything else? I'd love to change the cranks to Shimano and add some carbon bars...the jury is still out on the brakes! Oh, I gotcha. I was worried buying mine sight unseen because I wasn't sure what BB I could use. I am sure glad that when I'm ready I can ditch the square taper and go to Shimano. That was my happiest revelation when I opened the box! Putzing around with the bike today..
Got my bottle cage mounted and set up with a 32 Oval and a Surly 19T. God I hope it is dry tomorrow! Knowing so little about SS, I have no clue how that'll work out! My fatbike is set up as 32/21 and it's probably on the easy side. I'm guessing I'll end up putting my 17T on there for the majority of my riding. We'll see! Went on a group ride with the SS yesterday. Had a blast. Loving the oval ring. Rigid wasn't bad at all, despite an extremely rooty trail. The responsiveness of the bike so far outweighed the negatives. Just need to loosen my death grip a little and I'll be good. 32/19 might be a bit steep for me and the local trails. I didn't have too much trouble with our little climbs, but the only time I really felt god was on the couple flat smooth sections where I could spin good. Of course, that's riding at someone else's pace. Time will tell... but so far, loving this bike. I got a good deal on one last year and decided to give singlespeed a try. It's an awesome bike for the price although there are better options at the MSRP. My only complaint was the bottom bracket design. 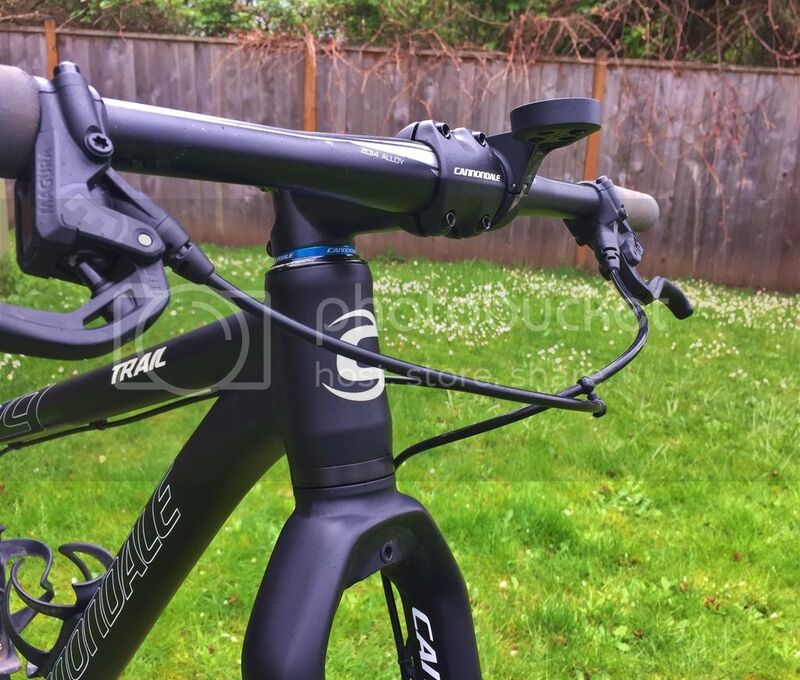 Will this bike take a tapered steering tube? 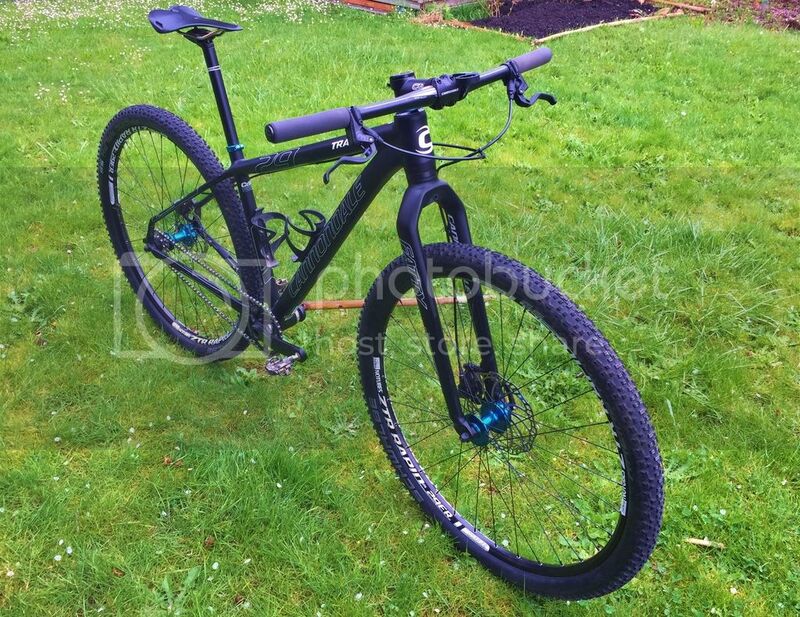 Salsa has a rigid 29er fork that might fit. I've been riding a carbon fork, just got a chromoly fork for my HT and I'm kind of liking it so far. Really liking it. But yeah, get your technique down first, at this point you probably won't notice the difference. Blue Sky has a couple of carbon bars on sale, they are giving them away. well then stick with it. 32/20 is gonna be pretty durn spinny on the flats. Although... the oval ring might help huh? If you try it, let us know how it works. 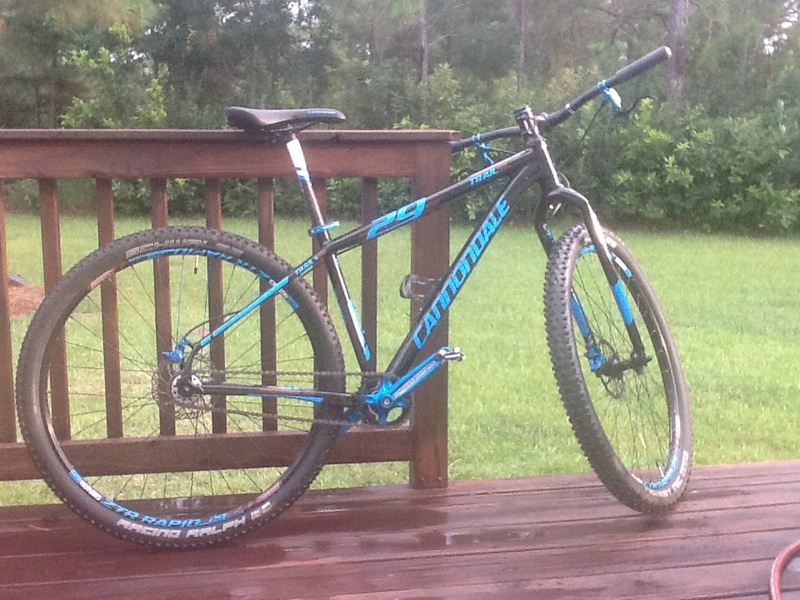 I was considering the same 2 bikes 4 months ago, and IMO at $800 you got a very good deal. Only thing i didn't like on my CD test ride was the 33/20. I wound up getting a ridiculously great deal on a Trek GF Rig with fox fork, i had heart set on rigid, but went ahead cause of price and actually love the bike. ...get your technique down first, at this point you probably won't notice the difference. Yeah...I'm going to run with it for a while! 32/20 is gonna be pretty durn spinny on the flats. Although... the oval ring might help huh? If you try it, let us know how it works. Yeah, a group ride isn't the best way to figure this out. I'd have been faster alone. Even when I was stuck at a snails pace mashing up stuff it wasn't bad. Not sure I meant that, but fitting. LOL. Thanks, Dave. Enjoy! I have a 2013 and love it. Added nobby nic tires/aftermarket wheels and hydraulic brakes. I think your model already has the upgrades brakes... Bring a tire guage with you and see what feels best. I usually run 25-32 depending on the trail. 40 is way rougher. A couple of great rides this weekend. Absolutely shocked at the climbing. I can more easily clean hills that were marginal on my geared bike and still feel better when I get to the top. So far 32/19 is working ok. It's a little spinny sometimes, but that doesn't hurt me near as much as loosing speed in the roots. The rigid front end wears me out a bit. Overall I'm doing laps at about the same speed I was suspended and geared. On my wish list are: carbon bars, chunky grips and a wider tire. I think that'll help a lot. I did bars, grips, and 2.35 tire on mine. It helped but honestly I think the money would be better spent on a better fork. Parts truck came today..2.35 Nobby Nic, Esi Chunkys, and I couldn't resist a sale on a perfect matched Race Face crankset. 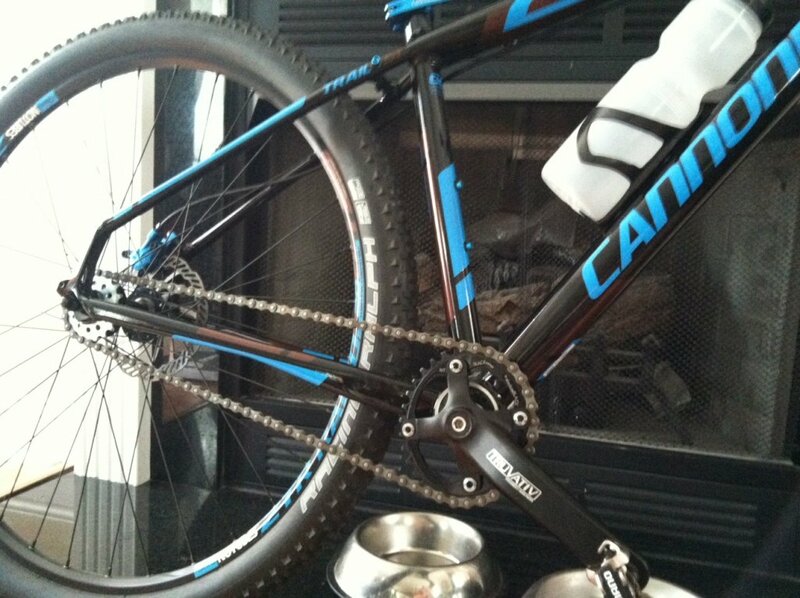 Do you notice a difference with the cranks? What model race face? Won't get a ride in until tomorrow. They're low end...Race Face Ride 1X factory take offs from Jensen. They were $75, I believe, with the BB and a 32T ring. 170mm instead of the factory 175s. I figured they'd be nearly the same weight, but they were about 150 grams lighter than stock. I love the light blue...that's a great looking bike. Very underated bike! I have the 2015 SS that came stock with the Magura brakes and the Stans rims. After a year of riding the bike is still stock with the exception of tires and and Time pedals. 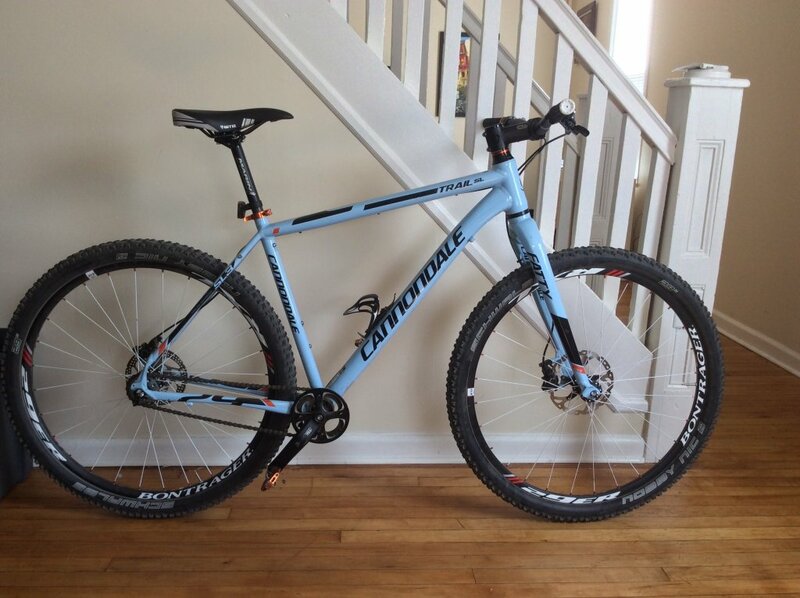 I have enjoyed this bike so much I have since sold my Cannondale Scalple 29er Alloy 3 Lefty! All the parts have proven durable and will only be upgraded due to wear. The fork is a little mean at times and I would love to try a carbon fork. Surprisingly my bottom bracket and crank have remained quite! I did get a couple ride in on the 170 cranks. I didn't expect much difference but it is noticeable. Slightly more difficult on the slow climbs, but way better spin. Maybe it's all placebo...but it feels good anyway. Try using plumber's tape on the BB threads. Worked well for me. So, I just picked up ones these off ebay new in the box for $500, which is a pretty good deal for what you get. Out of the box, the medium with all the reflectors and stock flat pedals weighed about 24.5lb. I made some small changes straight away with some things I had on hand, like different grips, saddle, pedals and the chain. I set up the wheels tubeless and I also replaced the stock Truvativ square taper crankset with a Sram X1. Weight is now 22lbs as pictured with the bottle cages and garmin mount, which is pretty reasonable considering there are no carbon components. First impression riding it was the whole front end felt way too high. Even with no spacers above the 20mm cone it felt like the bars were up in my chest, so I switched to a flat bar and made a new headset cover out of an old Cannondale System Six headset cover, which got the bars down about 1" lower. I've already had a chance to race it and it performed very well. Geometry feels good. For comparison sake, I've had two GF Rigs (G1 and G2) a Felt Nine Solo and a Chinese carbon 29er SS, and this handled better than any of those. The 1.5" steerer makes finding compatible stems difficult but it also makes the front end feel very stable. The Magura MT2 brakes are reasonably powerful. I can't really tell much difference between them and the XT brakes I had on my GF. But the plastic clamp is weak and already split around the bolt, so I ordered some new alloy clamps for pretty cheap. The wheels are pretty decent. Rims and rear hub are nice, but the front hub is low-end. Stock Racing Ralphs are good but not are the nicer ones I was hoping. They're rather the Performance line with dual compound and weigh 730g. But they roll well and all that. Oh, the EBB, I removed it and slathered it with anti-seize. Despite what I read, I think it's pretty well designed compared to what I've dealt with on the GF and the Felt. Overall, with a few minor changes it's a worthwhile bike and definitely nicer than others in it's price range. I bought a used SL3 on craigslist two years ago for $400 if I remember right. Could have been $450. Rode it for a year in southern california and used it in a 4 hour race. Great bike. Never had a problem with it other than a slight creaking sound. Im pretty sure the previous owner swapped some parts out so doubt it was stock. Was my first fully rigid SS and have been hooked ever since. New Dale Ball Trail to Little T.
How about some C-Dale Bling?